AdWords Display Advertising lets you place ads on a variety of news websites, blogs and other niche sites across the internet to reach more potential customers or visitors. Completing this Certification can drive huge traffic on your site. 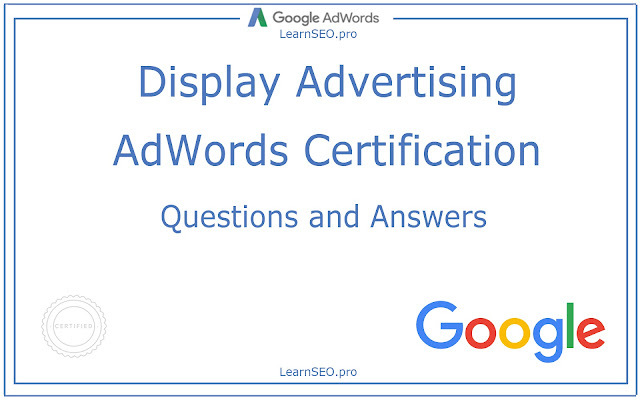 Here are AdWords Display Advertising Certification Questions and Answers to make your certified. Q: Which is a best practice for creating an effective ad using the Ad gallery? Q: An advertiser using viewable cost-per-thousand impressions (vCPM) bidding wants to maximize exposure on a specific set of sites selected for a new campaign. Which is a best practice when setting up the campaign? Q: Which of these metrics is typically most important in measuring a direct response advertiser’s performance on the Google Display Network? Q: Your client Anna wants to increase the reach and visibility of her ads. Which bidding strategy would you recommend? Q: Which is a benefit of using display advertising with Google to build brand awareness? Q: Your client has a cupcake shop in a hard-to-find alley in San Francisco. She’s advertising on the Display Network. What’s the best way to help people find her? Q: What functionality applies to HTML5 ads? * Re-run ad to increase the volume of people who will see it. Q: Jackie is an advertiser who wants to reach people by using both remarketing and Product Listing Ads. What’s the best targeting strategy for her? Q: Your client Christina wants to drive traffic to her site. She has return-on-investment goals and is already using AdWords conversion tracking. Which bidding strategy would you recommend? Q: What’s needed to create a “Display Network” campaign to start promoting an app in other apps and on mobile websites? Q: An advertiser who’s had success with text ads on the Display Network wants to start using rich media ads. Why should she consider using Ad gallery compared with other tools? Q: Which automatically expends your reach based on your campaign’s conversion history to help get as many conversions as possible? Q: You have a friend who has a small business, and she wants to manage her own AdWords campaign. She has no experience with AdWords and would like to experiment with different options. Which campaign type would you recommend to start? Q: Your client Kevin works for a retailer that sells eco-friendly products. He wants to attract an audience with an established interest in his message. What type of targeting would you recommend? Q: Your client has a Mexican restaurant and wants to increase brand awareness in the local community. What type of ad would you create to help reach your client’s goal? Q: Which targeting method allows an advertiser to reach people who have previously visited their website by showing them relevant ads when they visit other placements on the Google Display Network? Q: Your client Ali has a car dealership. She wants to reach people who are actively researching electric cars and ready to buy one. Which type of targeting would you recommend? It ensures maximum coverage, as some publishers do not accept all ad formats. Q: What is the best practice for building ads with Ad gallery? placement-targeted ad will be the only ad to appear in the unit. Display ad builder will allow the advertiser to easily create and change creative messaging. Select youtube.com or specific sections within YouTube where the ads will appear. Q: An advertiser promoting the release of a film that’s entirely in French with no subtitles wants to advertise on YouTube. He’s advertising it heavily in France through a traditional ad campaign, but wants to ensure that online ads reach the most relevant YouTube audience. Which should he do? Set language targeting options for the campaign containing the ads for the film. Non-text ads that use images, flash, video or other technologies, and appear alongside publisher content. Q: Which allows advertisers to see which sites referred visitors with the most time spent on site? Disclaimer: These answers resulted in 94%, so they are not all correct. Double check your answers while giving AdWords Display Advertising Certification exam! Mobile Advertising is used by experts to promote their brand, product, services or website on Phones and Tablets. It is also used to famous the Mobile Apps. Now you can get Mobile Advertising certification easily because LearnSEO.pro is sharing Questions and Answers of Google Mobile Advertising Certification Exam. _______ is a tool that can show you what happens after a customer clicks on your ads; whether they made a purchase, downloaded an app, or called your business. The advertiser is interested in cross-device conversions. This is the only availabe method of conversion tracking for iOS. The advertiser is using an in-house or third party app analytics system. Call Conversions help advertisers understand the value that calls from their ads are driving by counting calls of a minimum duration to a Google forwarding number as conversions. Disclaimer: These answers resulted in 89%, so they are not all correct. 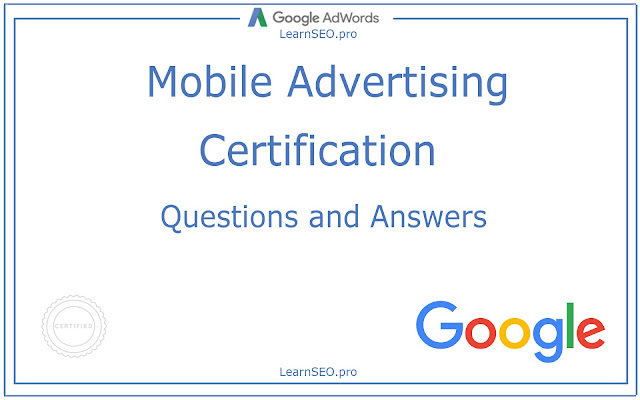 Double check your answers while giving Google Mobile Advertising Certification exam!